A common assumption is that if you work out a lot, you can eat anything you want. You’re burning so many calories, you can eat donuts, Cheetos, and butter-rich fettuccine Alfredo whenever you want and remain healthy and slim, while others have to painstakingly watch what they eat. Well, those of you who don’t work out may be gratified to know that it isn’t like that at all. Everybody I know who is athletic, myself included, has some very specific personal eating regime, with those foods that are sanctioned and those that are not. Athletes are definitely not eating anything they want. Food and the ideas surrounding it are as big a part of the sporting lifestyle as the active pursuit itself. 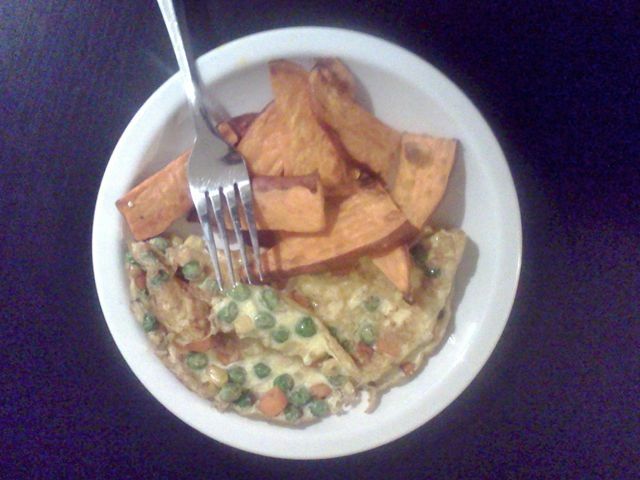 Workout food tends to be simple. Between wanting to get the best possible nutritional cocktail and spending most of your time and energy sweating, food becomes less of an art and more of a tool for performance and recovery, like any other piece of equipment. 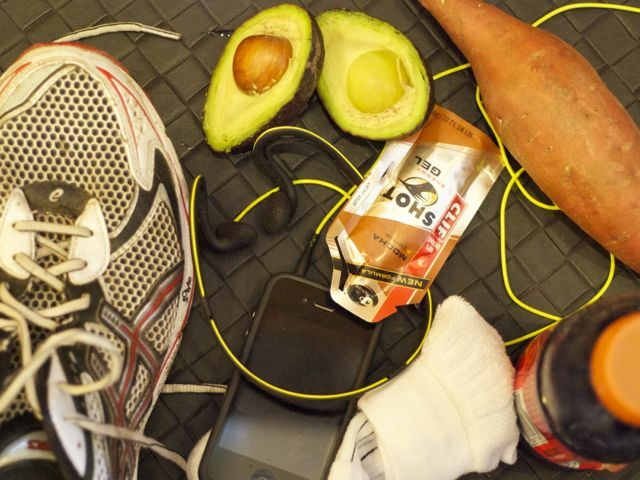 Running shoes, iPod, helmet, chicken breast, avocado: these things are extensions of the lifestyle. I end up making a lot of plain roasted vegetables and omelets with frozen veggies, because after a run it’s too hard to think about anything more complex, and at that point anything tastes good. Sure, there are athletes out there who like to cook more elaborate meals, but even they end up eating a lot of crackers and salami just to be able to keep up with their chronic and rapidly accruing calorie deficits. Athletes see food as fuel. You eat to get faster, stronger, to recover better, to increase your power-to-weight ratio (more muscle, less fat). How do you do that? Sports nutrition is constantly evolving as we learn more about how biology works. The current trends are toward whole foods, especially protein and vegetables, and away from processed foods and empty calories. The ultimate end of this way of thinking is the paleo diet, which many athletes have been adopting at different levels recently. The idea is that to make our bodies run better, we should eat as our hunter-gatherer ancestors evolved to do before the advent of agriculture and Wonder bread. This means, generally, eating lots of lean meats, vegetables, and fruit, and cutting out gluten, dairy, and processed foods. Some people avoid grains altogether, relying on starchy veggies like sweet potatoes, while others eat brown rice and other whole grains. Which begs the question: Were our Paleolithic ancestors all four-minute-milers? Maybe you’d have to be, in order to catch dinner. Stewart says he has seen remarkable gains when the athletes he coaches switch to eating this way: a 10 to 20 percent boost in performance, and a 20 to 40 percent improvement in overall health. Those numbers made me raise an eyebrow — is this 20 percent above a healthy athlete’s performance at the top of her game, or 20 percent better than she was when she was going to the Burger King drive-thru every night? Still, a diet rich in vegetables and protein ensures you’re feeding your body a lot of great nutrients no matter how you slice it, and many athletes are adopting this viewpoint with good results. All this is a long way of explaining why there are always a couple of sweet potatoes knocking around on the counter at the house that Steven Hunter, an amateur competitive cyclist and my boyfriend, shares with two of his teammates, Pete and Jeremy. This is what life looks like around there: Spandex, inner tubes, gloves, cycling magazines, foam rollers. Sweet potatoes, broccoli, chicken, hash browns, half and half, ice cream, coffee. They follow some of the paleo tenets, with modifications for their individual lives. Pete, who is part Indonesian, makes sure there’s always a pot of rice to dip into. Steven eats ice cream every night because without it he gets hungry in his sleep, and wakes up without the energy to get out of bed. That is how infuriatingly fast his metabolism is. The freezer door contains nothing but boxes of frozen hash browns, top to bottom: one box for each day of the week. On race mornings, everyone eats breakfast together, usually hash browns, pancakes, and some sort of scrambled-egg situation. Dinner is a grocery-store rotisserie chicken or steak cooked on the grill, plus broccoli, rice, and sweet potatoes or squash. The paleo diet harmonizes with the gluten-free and whole-food movements — but not with vegetarianism, which is also popular among the active and health-conscious. As with all diets, the paleo diet has its critics. Since our cave-dwelling days, people living in different parts of the world have adapted to thrive while eating a more diverse array of foods, and it is perhaps not sustainable (environmentally or economically) for everybody to be eating massive amounts of meat. Adnan Kadir, a bike racer and the owner of Aeolus coaching and training in Portland, Oregon — he and Jeb Stewart collaborate to run an annual training camp in California's Marin County — takes a more case-by-case approach. “Everyone is different, and what works for some doesn't work for others,” Kadir says in an email. Paleo or not, protein is also a big deal to most athletes, who need it to keep their muscles happy and strong. Rebecca FitzGerald, a Los Angeles-based marathoner, blogger, mother of three runners and wife of one more, has found protein to be a key factor in her family’s race times. “I saw a huge difference in my older boys’ performances this year when I purposefully increased their intake,” says FitzGerald, who is vegetarian and had in the past made meat a less-than-central element of her family’s menus. Now she cooks much more of it, as well as lots of eggs and beans to round it out. Ideas and opinions on nutrition are a huge part of sports culture. We talk all the time about what we should eat and why. It’s our version of talking politics or dissecting Lady Gaga’s latest costume. Trends come and go, but the one enduring idea that most people can agree on is that you need carbs for quick energy and protein for healthy muscles, simple as that. Carbs can come from many sources: whole grains, highly processed grains, starchy vegetables, space-age powder. Protein is available in many forms as well: hamburgers, almonds, raw horse meat, space-age powder. You are what you eat. What form and source you get your protein and carbs from may or may not make a difference for your performance. But it’s a huge ingredient in who we think we are. Our fetishizing of food runs alongside the ritualistic, devotional aspect of sport. When I get up in the dark to run before work, I mix up a glass of Gatorade, which I drink standing in the kitchen. Something about measuring out this special substance engineered specifically for athletes, and the fact that it’s the same stuff pro athletes and the tough guys in "Friday Night Lights" drink, and the fact that I do it in the same way every time, dating back to my early 20s when I took myself super-seriously, and the fact that I am wearing Spandex superhero tights, makes me feel like a disciplined athlete with a goal to conquer. The pre-workout fueling has the same effect as suiting up and fastening your helmet. It’s part of putting on your game face. It helps focus you. When I worked at a bike shop, there would always be the customers who came in the week before a big century ride (100 miles in a day) to buy nutrition-drink mixes. These organized events are always well supported, and you could get by just fine eating sandwiches and cookies at the aid stations every 20 miles along the course. But PB and J makes you feel like a kindergartener. High-tech powder products with manly names like Heed and Perpetuem make you feel like Lance Armstrong. Look at Rocky Balboa in the famous training montage in the first "Rocky" movie. Would Rocky have the same brawny appeal if he got up at 4:30 a.m. and made a blueberry-flax smoothie or unwrapped a Zone Perfect bar before hitting the library steps? Food also helps glue your team together. Those race-day breakfasts help give Steven and his teammates a sense of solidarity and camaraderie: gathering together to gain strength and confidence from one another, before getting crazy and muddy and laying it all down on the course. After running a particularly grueling 15-mile trail race last winter, I sat at a long pub table with about 15 other runners, some of whom I’d trained with, many of whom I’d never met. Sucking down beers, sharing stories of how we’d dealt with the course and how our finishing times compared to what we’d expected for ourselves, and seeing everybody looking just as tired and zombirific as I did, I felt like I was part of a community of like-minded weirdos, instead of just one solitary nut who considers sloshing around on a semi-frozen marsh a nice way to spend Sunday morning. Workout food cultures tend to skew in different directions based on the requirements of the specific sport, home economics, and time constraints. Endurance athletes, especially guys, tend to get carb-obsessed because they simply burn through so many. Women with office jobs who pump weights at the gym to stay fit need fewer calories than a lot of other athletes, and look for ingredients that are high in nutrients and low in calories: egg whites, fish, canned pumpkin, kale, berries. Athletes with more money than time buy wheatgrass smoothies, sushi, and Whole Foods salad bar concoctions. Rebecca FitzGerald, the blogger, creates a food culture based on the constraints posed by a one-income family full of male runners. While most moms are concerned with keeping their families healthy on a budget, she also needs to keep hers fast. She’s learned to balance what they need with what they can afford. “In the past, when I’ve tried to feed my family of five a strictly organic diet, we’ve fallen behind in our fruit and vegetable intake, because we could only afford, like, two grapes, a carrot, and a teaspoon of milk,” she says via email. FitzGerald, who prefers Whole Foods, shops at a local warehouse store instead so her family can have spinach, broccoli, and berries, too. But frugality has its limits. “I am pretty snobby about buying decent meat for the boys and my husband,” she says. No Costco steaks in their house. The most universal aspect of people’s various workout diets, other than the quest for protein, seems to be the banned foods we love to hate. Some people avoid gluten; others, animal products or processed foods. We all have something we can’t (or won’t) eat. We complain, but I think we like making these rules, because it gives us the illusion of control. You can’t control who shows up to a race, you can’t do anything about a sudden hailstorm, and you can’t predict how many sprints or tackles it’s going to take before some tendon gives up, but you can control what goes down the hatch. It’s tough to put so much sweat, time, and heart into something and know that in the end, the results aren’t really up to you. We take what surety we can grasp. Deprivation also has an aura of moral purity. Purity of plate, we hope, will lead to purity of spirit. Getting up and running every morning is like an affirmation. So, in its way, is eating unsweetened steel-cut oats every day. It’s not always fun, but fun isn’t the point. It’s supposed to eventually get us somewhere. By denying our desires, we show — to ourselves, mostly — that we can make sacrifices in order to reach a goal. Strength of character is just as important as having good legs if you want to win. All of these things go through my head when I shop for food or order at a restaurant. It’s hard to know what to choose, especially when you’re trying to keep other factors in mind, like money and logistics. I usually have to take a step back and prioritize. I know I’m not going to be a remarkably fast athlete no matter what I do; even with a 20 percent increase, I wouldn’t have a chance at placing in local foot races. I’m interested in improving my health (aren’t we all?) and strive to include as much produce and meat in my diet as I can afford, but if I’ve had a long week and am craving comfort food, I’m going to make a pot of Kraft macaroni and cheese and not feel bad about it. If I were a talented athlete with a crack at the Olympic trials or even simply at renown among my peers, maybe I would choose differently. So here I am in the supermarket dairy aisle, shopping before a run. A youngish, fit, urban, educated woman in Nike shorts, running shoes, and a ponytail, I am exactly who the grocery manufacturers were looking to target with products like Light & Fit fat-free yogurt made with sugar substitutes. Where is the full-fat, plain yogurt that I can glob honey into, that will keep me full for more than 10 minutes? I finally find a carton — there is only one brand of full-fat yogurt sold here — and put it in my basket next to my broccoli, sweet potatoes, and Gatorade. Meanwhile, some other fit, urban woman with a ponytail pushes her cart up to the yogurt section and plunks three six-packs of Light & Fit into her cart. She probably thinks the nonfat yogurt, and the egg-white omelets, and the 100-calorie bagelettes, are keeping her thin and powering her progression through marathon training. And she’s probably right. They’ve got protein and they’ve got carbs, the substances that make your body go. I’ll see her again at the starting line of the next local charity 5K, and we will both be smoked by some girl who eats pizza and Cap’n Crunch.